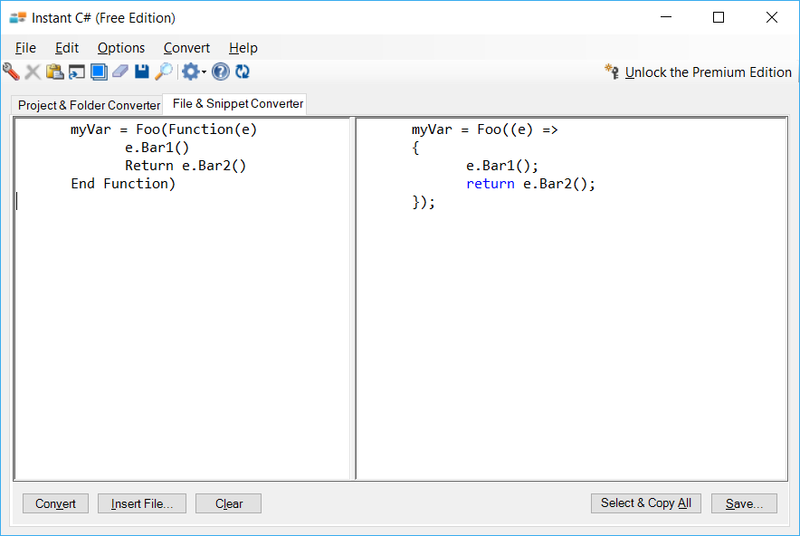 Instant C# produces great C# code, saving you hours of painstaking work and valuable time. 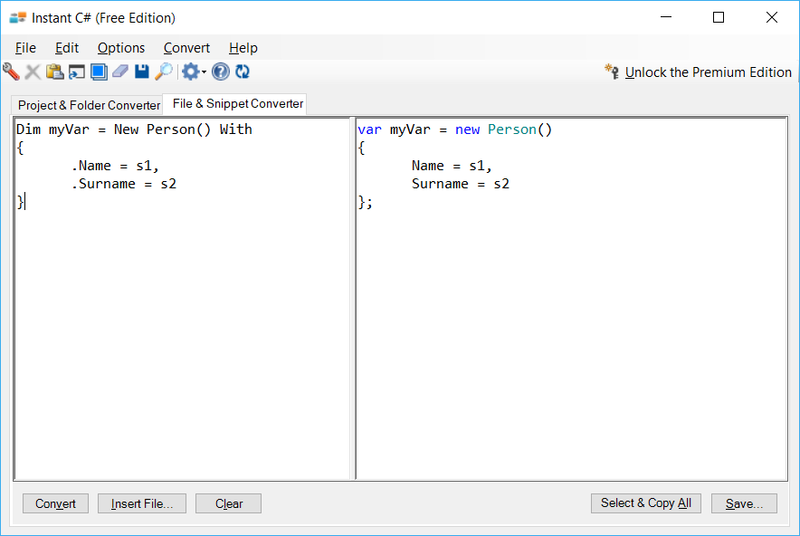 There are other VB.NET to C# converters – use the one that's right for you. *Scroll right to see Instant C# in action! Accurate - 99.98% on Microsoft's "101 Visual Basic Code Samples"
Your existing code is left completely intact. The new C# project is written to the new location that you specify. 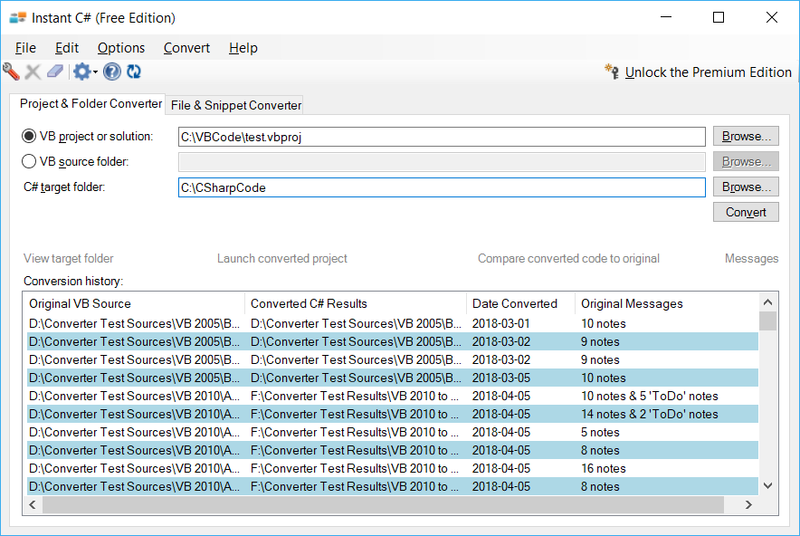 Q: Does Instant C# convert VB6 projects to C#? No. 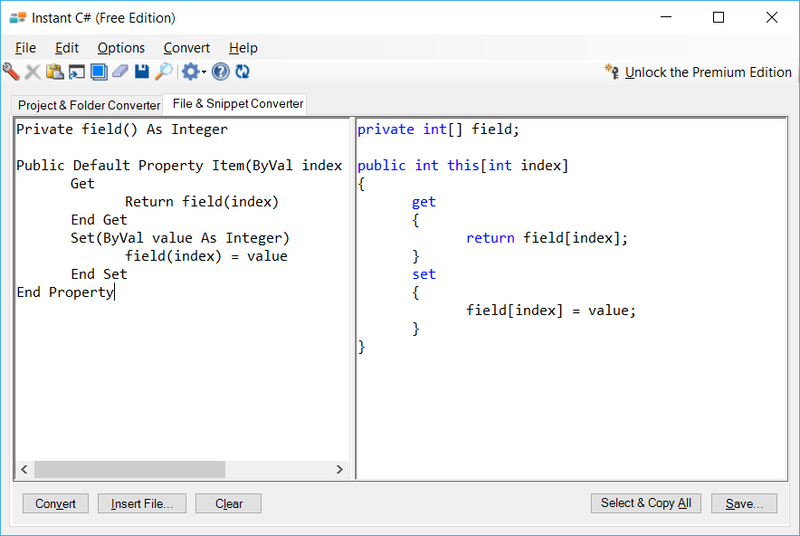 The most effective and safest way to get from VB6 to C# is to use an upgrade tool (3rd party or the VS 2008 Upgrade Wizard) on your VB6 code, and then use Instant C# on the resulting VB.NET code. Q: How are classic VB.NET string functions handled? 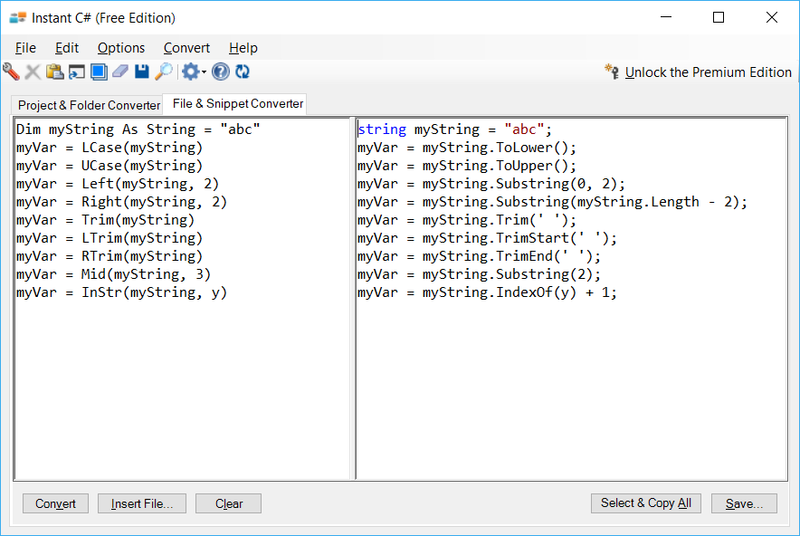 By default, Instant C# converts them to the closest .NET string method. 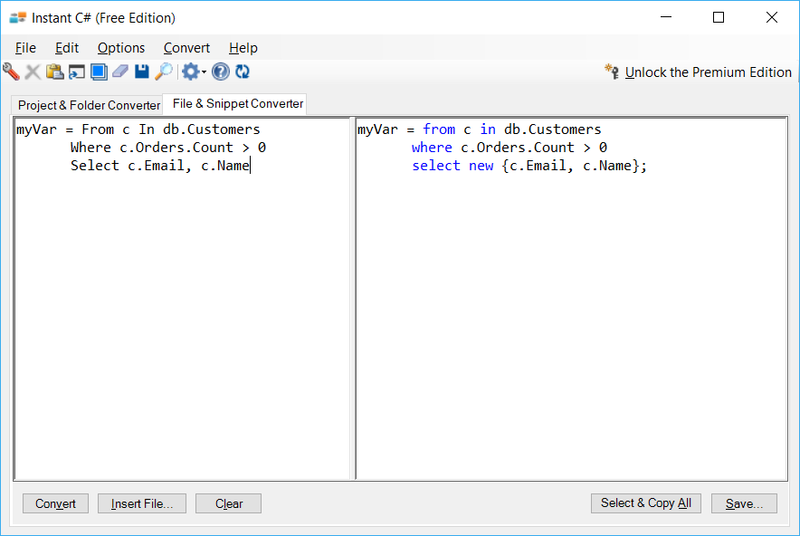 You also have the option of leaving them as calls to the Microsoft.VisualBasic namespace, if you are depending on some of the strange quirks of the classic VB string functions. 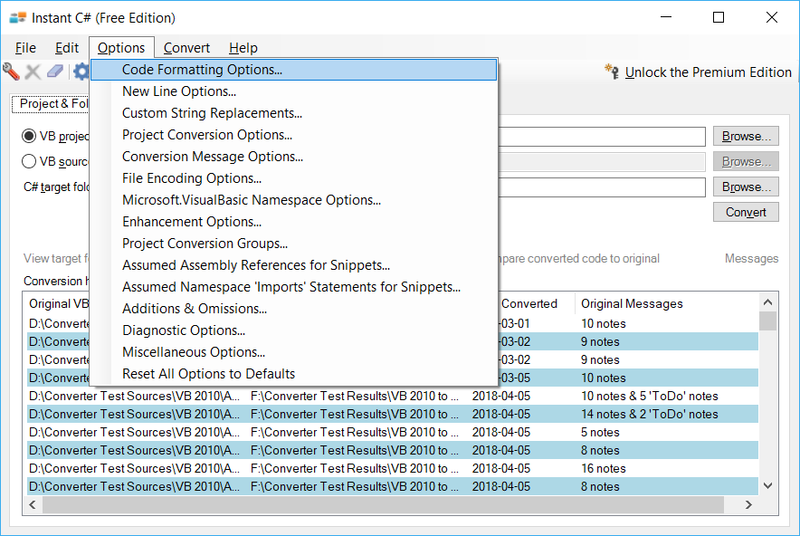 Q: Is VB.NET code within ASP.NET files converted? Although most On Error GoTo statements are converted, some elements of classic VB unstructured error handling (On Error Resume Next, On Error GoTo -1, etc.) are not converted by Instant C#. These statements are marked as a 'ToDo' task. Some references to the Microsoft.VisualBasic namespace are left intact (the code will run via references to the .NET Microsoft.VisualBasic namespace). You have the option of converting many of the .NET Microsoft.VisualBasic methods which have .NET equivalents, but in general Instant C# does not rewrite functionality in the .NET Microsoft.VisualBasic namespace. Files with vbhtml extensions (using 'Razor' syntax) are not converted.